Thank for your interest in this kit. This is a traditional color organ, in the sense that it responds to 3 different regions of the sound spectrum, and illuminates three different light groups (channels) accordingly. It is also traditional, in that its designed to illuminate 120VAC incandescent lamps, as opposed to LEDs. LED brightness has improved dramatically, since ~1994, so the need for this circuit is really not needed, and is only for those who like to venture into the old ways. 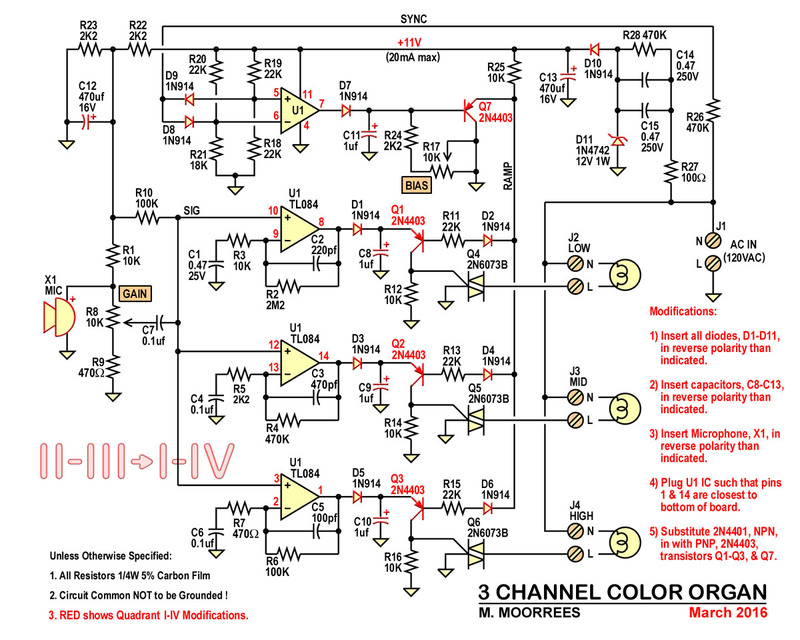 If you wish to make an LED color organ, here is a link to that kit (CL3). The LED color organ can safely, be directly hooked up to your stereo. Also with the addition on the Solid State relay kit (SR3), can drive 120VAC incandescent lamps. Kits are available at my eBay Store – Tortugascuba. Revision, March 1, 2016 – All kits sold after this date will be of the new revision CO3I. Note the “I” at the end. This is revision “I”, as in Inverted. The original kit, operated the TRIACs is modes I (one) and IV (four). 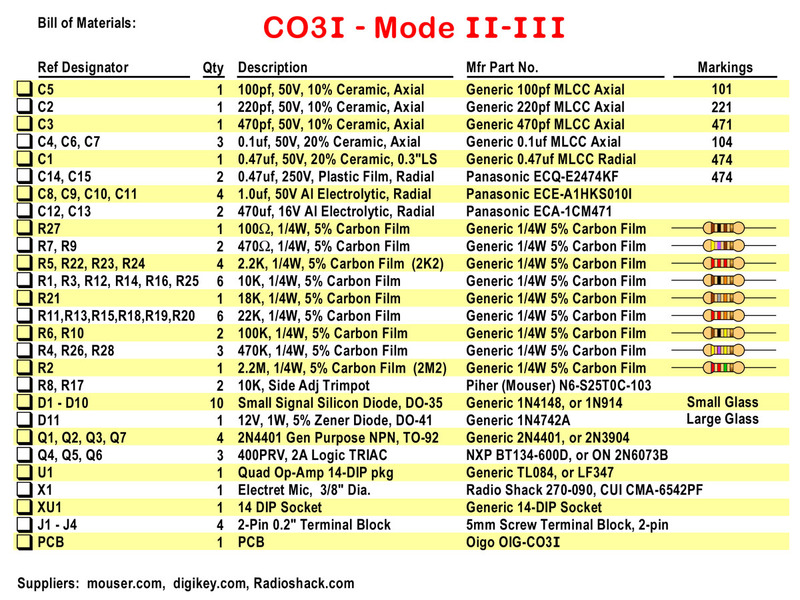 The new CO3I board, operates in modes II (two) and III (three). There are also a few minor value changes for channel separation. Use the proper BOM (bill of materials), schematic and Assembly drawing for the kit that you have ! The circuit is connected directly to the high voltage (120VAC) AC line so care must be taken when handling this circuit. It should ultimately be inside a proper enclosure to prevent it from being a shock and fire hazard. Never attempt to directly connect the sound source (Stereo, MP3 player, …) to this circuit ! This circuit directly connects to the AC Line, and can cause excess current flow, if connected directly to another circuit. I intentionally used a microphone, instead of an isolating audio transformer, used in older circuits. Those transformers often provide inadequate isolation, or provide isolation for only a limited time, before the insulation breaks down. Many stereos, in the 70’s went up in flames, from being hooked up to color organ improperly !! I witnessed it twice, myself ! The circuit, though, is an improvement on those that commonly came into use back in the 60’s thru 70’s. Those used mostly SCRs, that only pass half the AC sine wave. They also had no phase control, and used raw statistics, of the audio, to roughly adjust the brightness. It was a pure crap shoot ! This circuit works, using the TRIAC as it was originally intended. The way it’s implemented on most household dimmers. As such, the load (lamp) should be dimmable ! Recently, a customer used it on a Traffic light LED module. PLEASE DON’T ! These loads are not intended to be dimmed. Even though they are for direct 120VAC connection, they are COMPLEX LOADs. They have active circuitry (semiconductors, ICs …), that try to correct for variations in the line (incoming AC) and load (LED array), to maintain a constant brightness. Not only will they damage this circuit, and possibly, the LED module, they won’t even dim properly, because the that circuit is fighting against the color organ circuit. Lately, someone ask about 120VAC lamp, but mentioned Railroad signal 120VAC LED lamps, in passing. Didn’t seem to register, that they are the same ones used in traffic lights. SAME REQUIREMENTS. PLEASE DON’T USE THESE !! Be Smart ASK before you hook it up ! Why a Crap Shoot !? Its based on how both SCRs and TRIACs work. These devices are either ON or OFF. They DO NOT have a “middle” linear zone, were they only partially conduct, that transistors (and old vacuum tubes) have. There was a tube version of the SCR. It was called a thyratron, and it was not in a vacuum, but had a gas fill. When the audio, in the older circuits, was of adequate amplitude, it would turn ON an SCR. Where in the cycle, was purely arbitrary, and random. For low levels, it would kick the SCR ON for a few cycles, over any period of time. For high levels, it would turn ON more cycles, over the same time period. The result, was some crude control of brightness. To properly control a thyristor (SCRs & TRIACs), the device must be turned ON, at a controlled, and repeatable, point within each AC cycle (or half cycle, for a TRIAC). This circuit uses the audio amplitude to adjust the phase of the turn-ON, to ultimately adjust the brightness. You can actually set, the minimum brightness, when quiet, (Bias) to just make the lamp filament barely glow. Try this with the old circuits. It can’t be done with those ! 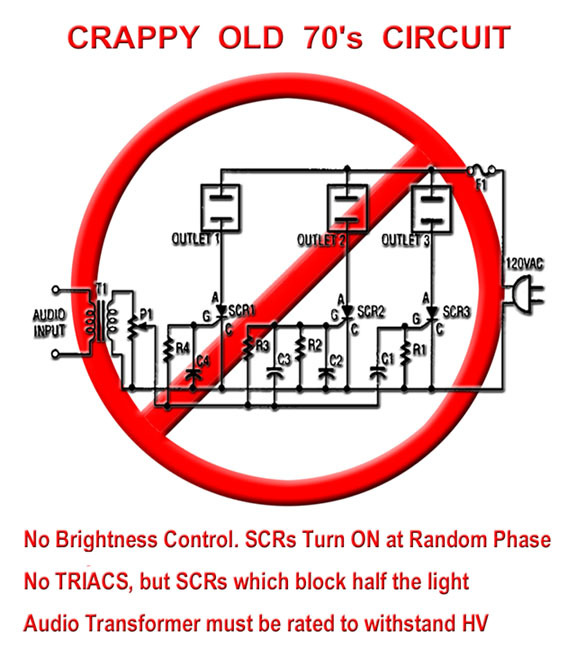 This circuit also uses TRIACs, and not SCRs. A TRIAC controls both halves, of an AC sine wave, for greater brightness. Since thyristors are either ON or OFF, all the power goes to the load (lamp), and none (or very little) is dissipated in the device (TRIAC), so they do not get hot, and do not need a heat sink. In most cases. Being only completely ON or OFF is also part of the magic of switch-mode power supplies, which are extremely efficient. This is the original, pre-March 1, 2016 drawing (I-IV). Its easier to follow than the mode II-III circuit. Both, though work just the same. This circuit, gets the audio, directly from the surroundings, thru a microphone. This can be viewed as a safety feature, as it does not connect to any audio source. Many older circuits used an isolating audio transformer. This method only works, if that transformer is rated to handle the full AC voltage between primary and secondary. Most small low cost audio transformers, now, do not meet that specification. Many didn’t meet it back then, either, and many a stereo went up in smoke, because of it. The audio, in this circuit, then gets amplified by 3 of the 4 stages, of a common quad op-amp IC. Each of these three stages are tuned to a certain portion of the audio spectrum. One for low frequency bass notes, one for high frequency treble notes, and the third in the middle. These channels overlap, because the filtering is only 1st order. Each of the amplified audio signals are then passed thru a diode and capacitor, which results in only the envelope of their amplitude from passing further. Those three envelopes are used to control each channels brightness. The brightness is controlled by turning on the TRIAC’s gate at a certain time relative to the AC power’s “zero crossing”, or phase. The earlier, the gate is turned ON, the brighter the lamp. The drawing, above, shows how this is done. The “zero” reference, is set, using the 4th op-amp stage, wired as a zero-crossing detector. When the AC is near zero, the comparator’s two voltage dividers, are set so the output is high. When the AC is too positive, the signal passing thru D8, pulls the inverting input (-) of the comparator greater than the non-inverting (+), input, dropping the output low. When the AC is too negative, the signal passing thru D9, drags the non-inverting (+) input lower than the inverting (-) input, again causing a low output. The output is only high during a small region when the AC is near zero. The zero crossing is used to reset a negative going ramp, who’s time constant is adjusted by the bias trimpot, R17. This also has the effect of adjusting its amplitude. The ramp is fed to the three PNP transistors’ bases, that actually drive the TRIACs’ gates. These transistors act as simple voltage comparators. When the control voltage (for each channel), which is tied to the emitter, is higher than the ramp voltage, the transistor conducts, and passes current into its respective TRIAC gate. The higher the control voltage, the earlier, in the cycle, the TRIAC is turned ON. A resistor is stuck in the base leg of each transistor, to limit the base current. A diode is also inserted, to block reverse current. Transistor base emitter reverse voltage specs are usually 5 to 6V max. Also any reverse voltage can permanently make any transistor noisier. There are limitations to using a transistor as a comparator. The compare voltage is offset by 0.7V, which varies some with temperature. The output tracks the emitter voltage, and all current that is delivered to the output, comes from the emitter side. In this case that’s fine. Once the TRIAC is turned ON, no more gate current is needed. There is no conduction, in the emitter-collector path until the “threshold”, it reached, then that current is dumped into the gate. Very similar to the function of an old fashion DIAC. Except here, the “threshold” varies with base voltage. Otherwise, the CO3I functions the same as the original CO3. The louder the sound, the brighter the light (with both circuits, CO3 & CO3I). This circuit works the same as the original circuit, but with inverted polarity. It uses a -11V supply to operate the circuit, as opposed to +11V, in the original circuit. That means to turn on a TRIAC, the gate is brought to some negative (non-zero) level. This is mode II (two), if the AC wave is in the positive half of its cycle, or mode III (three) when the the AC wave is in the negative half of its cycle. To accommodate these modes, all the two leaded polarized devices have been reversed. The transistors have been switched from PNPs to NPNs. Otherwise, the circuit works just the same. Only Inverted. Why change, from I-IV to II-III ? Reliability and flexibility. Modes I, II, and III have nearly the same gate trigger sensitivity. Mode IV may be as much as 5 times less sensitive. With the parts provided this should not be an issue. But at elevated temperatures, or 10-years down the rode, the mode IV triggering may malfunction. It probably won’t be noticed, since the TRIAC will just act as a SCR. Mode II-III operation also allows for a greater parts selection. There exists many TRIACs that are designed not to work in Mode IV, since mode IV has trouble with inductive loads, like motors. Note, that the orientation of the polarized components, are reversed from that of the original version. However, still follow the silkscreen, since it has been revised accordingly. Make sure all parts are oriented properly. The stripe on the diodes indicates their cathode lead. Sometimes its too close to the middle. In that case, look at for any text. That text will be on the anode side, because if made properly, that’s where most of the space should be. Modern electrolytic capacitors have a stripe on the negative (-) side, which is opposite of the “+” sign on the silkscreen. Also R21, is a 18K resistor with a grey second band, which might look black, and be confused with the many 10K resistors. For 220V operation, look at the original version documentation. That portion has not changed. Be sure to insert the proper component into the proper location, and in the proper orientation, where applicable. There is an 18K resistor (R21), with a second band which is gray. Take care, since it can easily be confused with the black band on the 10K resistors. Note: two capacitors have been provided for C6. One is an 0.1uf axial, while the other is a 0.022uf ceramic disk. Its up to you, which you want to install in the circuit. You will find that J1 thru J4 come in one 8-pin block. That block is actually formed from 4 2-pin interlocking terminal blocks. 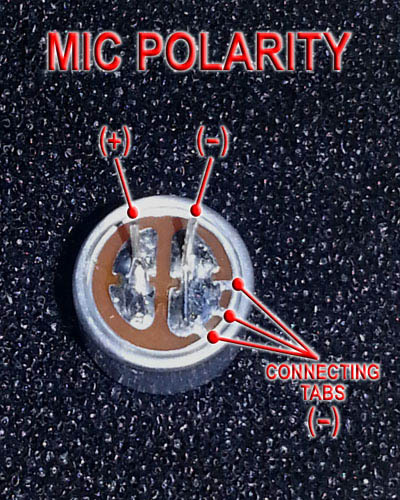 Microphone polarity: make sure its installed properly. This unit should only be used to drive lamp loads. Mostly incandescent lamps, with a combined rating (per channel) not exceeding 200W. It should also drive 120V rated LED Christmas lite strings, since those mostly just have a simple resistor current limiter. Only drive individual 120V LED lamps, if they explicitly allow dimmer use. Halogens are fine, too, if they are 120V and under 200W. NEVER use with fluorescent lamps, or other lamp technologies that are not listed here. No motors, either. This unit uses Logic TRIACs, which have more trouble with inductive loads, than most variations of TRIACs. No phase control on either, though as you can see, it could have been done at the time with the technology available. The quad op amp, I use could easily be replaced by descrete components. So it wasn’t the fault of some long haired hippies ! Predates them, and even the beatniks … maybe. Maynard Krebs is innocent ! Instead of 2 0.47uf capacitors, for the 120V version, only one is needed. It does need to be rated for at least 400V. It can be inserted in either the C14 or C15 location. Other changes are R26, is doubled to 1M (was 470K). It will still function with the original 470K, but the zero crossing pulse will be widened, yielding slightly less maximum brightness. R24 need only be changed to 6.8K (was 4.7K) if the line frequency is 50Hz. In the United States, 230V is available, though at 60Hz, and therefore no need to alter R24. Much of the world does, however, use 50Hz. Basically, reverse all the diodes and electrolytic capacitor, to the opposite orientation of what’s shown on the silkscreen. Also, reverse the microphone, and flip the IC, U1, around so that pin 1 is closest to the bottom edge of the board. And replace all the transistors with PNPs (2N4403, 2N3906, MPSA55 …). One VERY IMPORTANT POINT ! 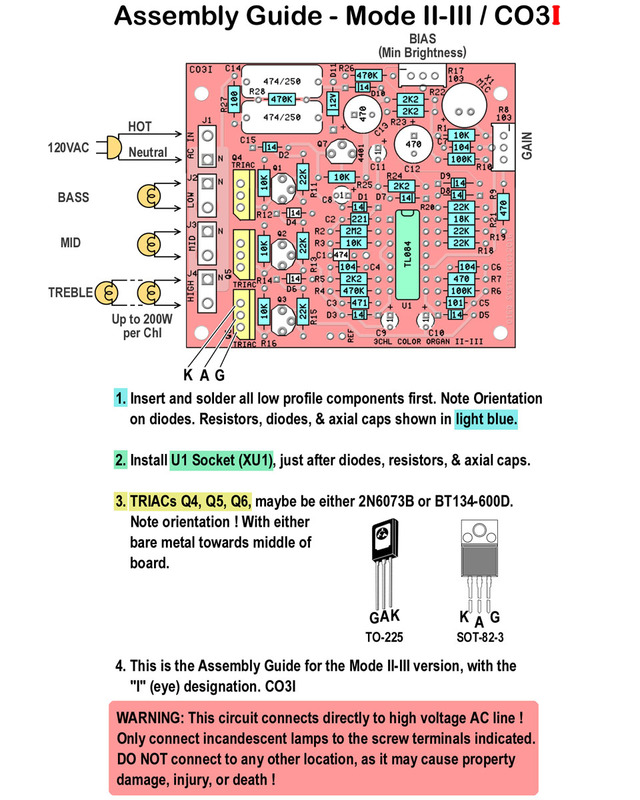 Make sure that the TRIACs shipped with the kit are NOT 3Q (three quadrant) TRIACs, such as the BTA202X. If they’re such devices, then the unit will operate like a simple SCR (Mode I, only). 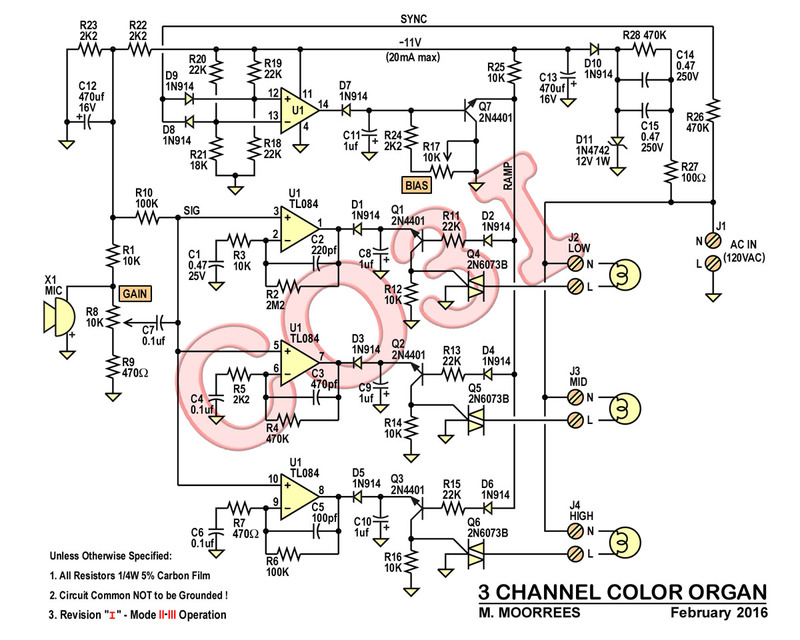 TRIAC Datasheets: These devices have been found to work properly in this kit. Any of these may be found in the kit, as shipped. Go visit my Mood Lite Kit page for the single channel versions.